A conversation with Devereaux Sinclair and Poppy Kincaid as told to Denise Swanson author of the Devereaux's Dime Store mysteries. “Dev, did you say a book club is holding their meeting in your store?” My best friend Poppy Kincaid asked as she handed me a glass of wine. “What, the knitters and scrapbookers weren’t exciting enough for you?” Poppy smirked. “What?” Poppy swiveled on her stool, spotted the offenders, and marched over to take care of them. It was funny to watch the tanked-up cowboys cower as my friend lit into them. Poppy looked a lot like fairy princess, but her she was proud of her reputation as our hometown’s bad girl. Especially since her father was Shadow Bend’s chief of police. Poppy and her dad’s relationship was a lot like the one I had with chocolate, I knew I should learn to control myself around it, but it was a lot more fun not to. When Poppy returned from her mission, the sloshed men had slunk off to their table and were attempting to sober up enough to drive home by consuming a greasy plate of wings and a pitcher of water. “The Stepping Out Book Club’s selection is a volume of poetry by a local author.” I knew this because the group had purchased the book through me. That, along with paying me to provide the refreshments, had made the event profitable enough for me to host. “Is the poet speaking at the club?” Poppy asked as she dug a tube of lip-gloss from the pockets of her tight black jeans. “Yep.” I twisted the end of my ponytail around my finger. “Lance Quistgaard is honoring them with his presence. His tome is called Ode to a Small Midwestern Town so I think it might be about Shadow Bend. Little did we know, that poetry could be murder. 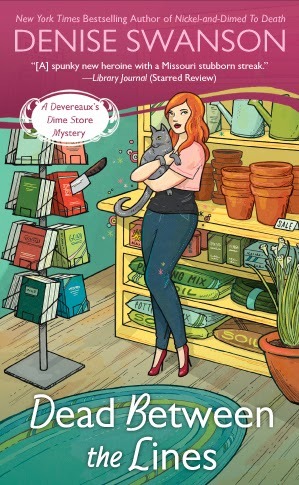 I haven't read the Dime Store mystery series but if they are as good as the Scumble River series, I know I'll enjoy them. That sounds like one scary book club meeting! I have this book on preorder and can hardly wait to read it. I love Dev.